As reported by Och Aye The News. In a report published today the wholly independent UK Government boffins claim that, if Scotlandshire were to separate from England, it would be left with no cover against celestial peril. 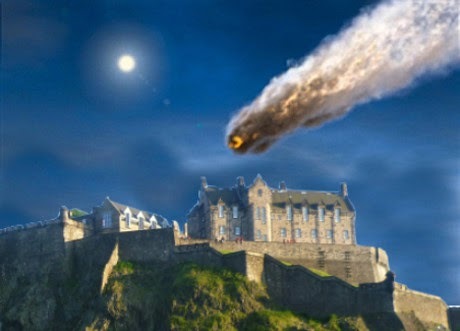 The tiny Scottish Defence Force would be unable to prevent a hail of meteors - which could fall from the sky at any time – from causing huge devastation and loss of life. Dr Alisdair Allan MSP, the Scottish Government's Science & Education minister said, “While the conclusions of the LSE report are undoubtedly accurate, its authors fail to mention that there are no current means of shielding Scotlandshire from meteor showers. “The kind of technology required to provide protection from celestial objects doesn't even exist. So, to claim that the danger would be increased by independence doesn't make any sense.